MSc. Florencia Braga. Manager, Scientific Affairs, EMEA. Herbalife Nutrition. Breakfast literally means ‘break the fast’, as it is the first meal of the day designed to break the fast after the night period and is usually consumed within two to three hours of waking. Regarding its nutritional composition, a healthy breakfast should provide between 15 to 25% of the total daily energy intake [1,2], and should achieve between 10 to 20% of the Daily Reference Value (DRVs) for fibre and most vitamins and minerals. Greater percentages of nutrients like Calcium should be covered with this meal [1,2]. Even though there is flexibility on which food groups should be consumed during breakfast, protein-rich, nutrient-dense, carbohydrate-rich (cereals, grains, fruit or/and vegetables) foods are considered essential to replenish nutrient storage after the period of fasting while sleeping . Regarding protein-rich foods, it is advised to choose from eggs, lean meat, meat substitutes (vegetable protein), legumes, nuts, and dairy products with special attention in controlling sodium and saturated fat levels . Breakfast is frequently regarded as the most important meal of the day, and although every meal is important, science has shown that a daily breakfast provides a wide range of health benefits not only on physical, but also on mental health. There is evidence showing that those individuals who have breakfast on a regular basis have a more balanced overall diet with nutrient and food selection that can fulfil their nutritional recommendations [3-5]. Indeed, daily fruit intake is higher in breakfast eaters with an increased likelihood of meeting the ‘5-a-day’ requirement with all the associated benefits this brings [5-7]. Healthy breakfast eaters usually have better habits throughout the day  and this will result in a positive impact on their overall health. Nevertheless, it has been shown that breakfast consumers have an increased vitamin and mineral intake because of having breakfast which is usually not compensated by any other meal during the rest of the day by breakfast skippers [5,8]. As opposed to what some people believe,  skipping breakfast is not an effective method for weight control . Some studies have shown that breakfast skippers have a higher body mass index (BMI) and waist circumference than breakfast consumers [ 5,6]. A study run in Spain showed that the risk of abdominal obesity was 1.5 times higher in breakfast skippers compared to breakfast consumers . Although lot of research still needs to be done, there are several reasons why regular breakfast is related to better body weight control. First, due to its potential effect in hunger/satiety regulating hormones , breakfast consumption is associated with a low feeling of hunger during the following hours, helping to get to lunch time with less appetite. But not every breakfast would do the trick, as high protein breakfasts are considered to be more satiating than the ones with regular protein content [12,13]. High protein breakfasts have also shown to reduce the sweet and savoury cravings during several hours compared to breakfast skippers , which may help to cut-down on snacking throughout the morning [11,15]. In this sense, a high protein breakfast might help to reduce the caloric intake during lunch  and total daily caloric intake, compared to breakfast skipping . Secondly, as mentioned above, breakfast is the perfect opportunity to start the day with a healthy and balanced diet which could help to achieve a normal weight. Finally, regular breakfast consumption has been associated with higher none-structured physical activity, especially during the morning [ 17,18]. This means that, without noticing it, we move more. One of the possible suggested mechanisms for this is that when cutting the night fast, our bodies perceive the availability of energy (the exogenous glucose coming from the breakfast) and increase the energy expenditure through physical activity. In other words, our bodies sense that they don’t need to ‘save’ energy [17,18]. Breakfast skipping is not only related to weight gain, but also with worse blood glucose control and increased risk of type 2 diabetes. In fact, at the beginning of this year, a study conducted by researchers from the German Diabetes Centre which reviewed different studies published on the matter, including 96,175 participants in total, suggested that skipping breakfast is associated with a 33% higher risk of having type 2 diabetes, which is in part explained by an excess of body weight . Skipping breakfast has also been shown to be a risk factor for lower muscle mass . Partly because protein intake at breakfast attenuates the overnight fasting protein losses , and partly because breakfast represents a very good opportunity to help to get the daily amount of protein that your body needs. It is well known that adequate protein consumption in combination with physical activity are key pillars for building and maintaining muscle mass. But, when it comes to muscle building support, not only the amount of protein consumption is important but also the quality, timing and distribution of protein during the day. Several studies suggest that around 20g of high-quality protein should be consumed per meal, to better stimulate muscle building, including breakfast occasion [22,23]. In addition to this, it’s also been shown that when protein intake is evenly distributed throughout the day, muscle support is greater than when protein is consumed in a skewed manner . Moreover, the consumption of a high protein breakfast containing between 25-30 g of protein has shown to promote the increased utilisation of dietary protein and stimulate its use by the muscle . Studies suggest that the omission of breakfast prior to exercise might impair subsequent exercise performance in habitual breakfast consumers . But more surprisingly, exercise performance impairment when skipping breakfast has also been evidenced during evening exercise as well . After an overnight fast, our body’s fuel stores are reduced, and breakfast can help to top-up these fuel stores to support exercise performance. Some studies have suggested that breakfast consumption improves cognitive function and mood [27,28]; but these benefits have been found, in the majority of cases, with a healthy breakfast only [27,29]. Additionally, eating breakfast prior to doing physical activity has a positive impact on mood, on reducing mental fatigue and increasing alertness .Some of the suggested mechanisms through with breakfast can support cognitive function are the improvement of the overall nutritional status, and the modification of blood glucose concentration . Despite being regarded as the most important meal of the day, and all the health benefits associated with a regular consumption of a healthy breakfast, this might not be a habit regularly practiced by many. The breakfast habit appears to be less frequent when children enter teenage years, and, in some cases, they go back to it during adulthood . Although it may not be the case for all European countries, there is still a proportion of the adult population missing breakfast every day , with more than 15% of young adults in Spain, and more than 30% of adults in Switzerland not consuming breakfast regularly [31,32]. Sometimes, a hectic life style makes it difficult to spend a lot of time preparing a healthy breakfast. Particularly during working days, breakfast needs to be quick and easy while providing all necessary nutrients to keep up with the intensity of daily activities. Set out dishes, utensils, and non-perishable ready-to-serve foods the night before. Prepare hard-cooked eggs the night before so they are ready for a quick ‘to-go’ breakfast. Layer fruit, cereal, and low-fat or fat-free yogurt for a fruit parfait to go. Keep easily accessible nutrient-dense foods like dry fruit or bars in the car, or in a bag to eat on the way to work. Make a grab-and-go healthy smoothie or shake. Make sure you choose protein and vitamin and mineral rich ingredients. Gibney MJ, et al. Towards an Evidence-Based Recommendation for a Balanced Breakfast-A Proposal from the International Breakfast Research Initiative. Nutrients. 2018 Oct 18;10(10). pii: E1540. Matthys, C. et al. 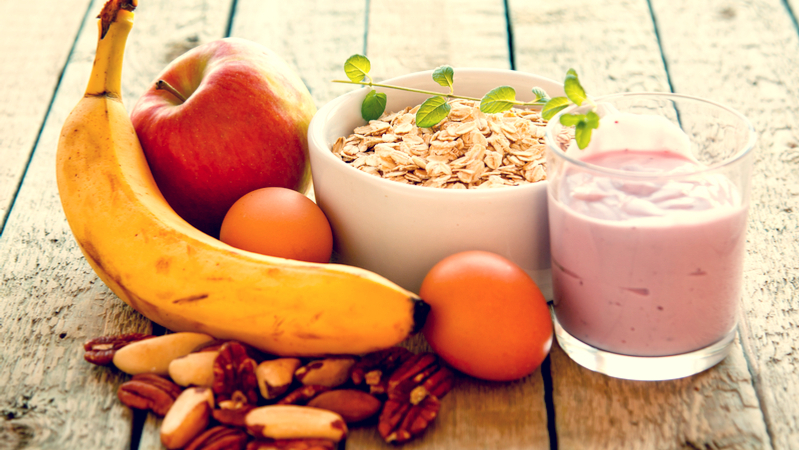 Breakfast habits affect overall nutrient profiles in adolescents. Public Health Nutrition. Public Health Nutr. 2007 Apr;10(4):413-21. Gaal S, et al. Breakfast Consumption in the UK: Patterns, Nutrient Intake and Diet Quality. A Study from the International Breakfast Research Initiative Group.Nutrients. 2018 Jul 30;10(8). Fayet-Moore F, et al. Breakfast Choice Is Associated with Nutrient, Food Group and Discretionary Intakes in Australian Adults at Both Breakfast and the Rest of the Day. Nutrients. 2019 Jan 15;11(1). pii: E175. Azadbakhtm, L. et al. Breakfast eating pattern and its association with dietary quality indices and anthropometric measurements in young women in Isfahan. Nutrition. 2013 Feb;29(2):420-5. Kant AK, Graubard BI. Within-person comparison of eating behaviors, time of eating, and dietary intake on days with and without breakfast: NHANES 2005–2010. Am J Clin Nutr. 2015 Sep;102(3):661-70. Cho, S. D., et al. The Effect of Breakfast Type on Total Daily Energy Intake and Body Mass Index: Results from the Third National Health and Nutrition Examination Survey (NHANES III). J Am Coll Nutr. 2003 Aug;22(4):296-302. Gwin JA, Leidy HJ. A Review of the Evidence Surrounding the Effects of Breakfast Consumption on Mechanisms of Weight Management. Adv Nutr. 2018 Nov 1;9(6):717-725. Leidy HJ, Racki EM. The addition of a protein-rich breakfast and its effects on acute appetite control and food intake in ‘breakfast-skipping’ adolescents. Int J Obes (Lond) 2010, 34:1125–1133. Leidy, H. H., et al. A high-protein breakfast prevents body fat gain, through reductions in daily intake and hunger, in “Breakfast skipping” adolescents. Obesity (Silver Spring). 2015 Sep;23(9):1761-4. Melson CE , Nepocatych S , Madzima TA .The effects of whey and soy liquid breakfast on appetite response, energy metabolism, and subsequent energy intake. Nutrition. 2018 Nov 27;61:179-186. Ruddick-Collins LC, et al. The Big Breakfast Study: Chrono-nutrition influence on energy expenditure and bodyweight. Nutr Bull. 2018 Jun;43(2):174-183. Betts JA, et al. The causal role of breakfast in energy balance and health: a randomized controlled trial in lean adults. Am J Clin Nutr. 2014 Aug;100(2):539-47. Zakrzewski-Fruer JK, et al. Association between breakfast frequency and physical activity and sedentary time: a cross-sectional study in children from 12 countries. BMC Public Health. 2019 Feb 21;19(1):222. Ballon A, Neuenschwander M and Schlesinger S. Breakfast Skipping Is Associated with Increased Risk of Type 2 Diabetes among Adults: A Systematic Review and Meta-Analysis of Prospective Cohort Studies. J Nutr. 2019 Jan 1;149(1):106-113. Yasuda J, et al. Skipping breakfast is associated with lower fat-free mass in healthy young subjects: a cross-sectional study. Nutr Res. 2018 Dec;60:26-32. Karagounis LG, et al. Protein Intake at Breakfast Promotes a Positive Whole-Body Protein Balance in a Dose-Response Manner in Healthy Children: A Randomized Trial. J Nutr. 2018 May 1;148(5):729-737. Mamerow MM, et al. Dietary Protein Distribution Positively Influences 24-h Muscle Protein Synthesis in Healthy Adults. J Nutr. 2014 Jun; 144(6): 876–880. Witard, OC. Et al. Myofibrillar muscle protein synthesis rates subsequent to a meal in response to increasing doses of whey protein at rest and after resistance exercise. Am J Clin Nutr 2014; 99:86–95. Bin Naharudin MN, et al. Breakfast Omission Reduces Subsequent Resistance Exercise Performance. J Strength Cond Res. 2019 Jan 30. Cornford E, Metcalfe R. Omission of carbohydrate-rich breakfast impairs evening 2000- m rowing time trial performance. Eur J Sport Sci. 2019 Feb;19(1):133-140.
Cooper SB, et al. Breakfast consumption and cognitive function in adolescent schoolchildren. Physiol Behav. 2011 Jul 6;103(5):431-9. Miki T, et al. Breakfast consumption and the risk of depressive symptoms: The Furukawa Nutrition and Health Study. Psychiatry Res. 2019 Jan 24;273:551-558. Ferrer-Cascales R, et al. Eat or Skip Breakfast? The Important Role of Breakfast Quality for Health-Related Quality of Life, Stress and Depression in Spanish Adolescents. Int J Environ Res Public Health. 2018 Aug 19;15(8). pii: E1781. Veasey, RC., et al.The Effect of Breakfast Prior to Morning Exercise on Cognitive Performance, Mood and Appetite Later in the Day in Habitually Active Women. Nutrients. 2015 Jul 14;7(7):5712-32. Chatelan A, et al.Association between breakfast composition and abdominal obesity in the Swiss adult population eating breakfast regularly. Int J Behav Nutr Phys Act. 2018 Nov 20;15(1):115. Ruiz E, et al. Breakfast Consumption in Spain: Patterns, Nutrient Intake and Quality. Findings from the ANIBES Study, a Study from the International Breakfast Research Initiative. Nutrients. 2018 Sep 18;10(9).